Families of World Trade Center victims say the Sept. 11 commission and former Mayor Rudolph Giuliani failed them by "sugarcoating" their questions and answers in a public hearing. Relatives jumped out of their seats and shouted at the panel and the former mayor, who testified Wednesday on the second and final day of the hearing examining the city's emergency response. They said the commission feebly addressed crucial issues like malfunctioning firefighter radios and what they see as the city's lack of disaster preparation, failing to push Giuliani as he testified that New York was "unbelievably capable" and "terrifically effective." "He could have been a great source for what needs to be changed," said Wells Noonan, whose brother died in the north tower. "The panel didn't press hard enough." Monica Gabrielle, whose husband was killed, said the panel and Giuliani spent the morning "cloaking everything in heroism." 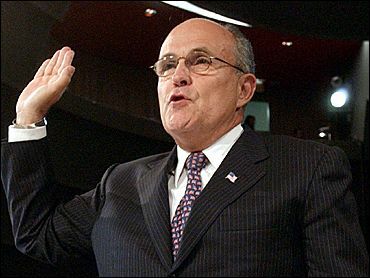 During Wednesday's hearing, commission members repeatedly saluted Giuliani's leadership and refrained from challenging his positive portrayals of the Sept. 11 rescue operations. "There was not a problem of coordination on Sept. 11," Giuliani said. "We got a story of heroism, we got a story of pride, and we got a story of support that helped get us through." Several relatives of victims said they were disgusted that the 10 members of the commission, each allowed about five minutes to question Giuliani, wasted time with redundant praise. Commission chairman Thomas Kean, for one, told Giuliani: "New York City on that day, in a sense, was blessed because it had you as a leader." One statement thanking Giuliani should have been enough, the families said. "The commission members don't press hard at all," said Beverly Eckert, whose husband was killed. "We leave frustrated," Gabrielle said. "They made a huge faux pas in letting Rudy Giuliani polish his crown." Targeting Giuliani is a reversal for many of the victims' relatives, who since the attack have generally praised him as a steady leader through the chaos. After leaving office at the end of 2001, Giuliani has consistently sided with family coalitions on issues involving the trade center site, once even calling for the entire 16 acres to become a memorial. But relatives of firefighters are upset over reports that faulty radios may have doomed some of their loved ones. Fire Department radios had long been an issue before Sept. 11. "Talk about radios. Talk about the radios," some yelled. As Giuliani left, one shouted: "My brother was a fireman. I want to know why 300 firemen died." Asked on Thursday's CBS News Early Show about his testimony about the outbursts from the victims' relatives, Giuliani said he expected that reaction. "Their anger I understand, because they went through just terrible loss," the former mayor said. "But I think the anger is misplaced. The anger should not be at the people who tried very, very hard did the best they could to try to save their loved ones." "The anger has to be directed at the people who attacked us," Giuliani said, adding that "mistakes were made and those mistakes should be focused on." "But not from the point of view of this kind of hatred and anger and blame being placed on some of the people who made these decisions, who I think were make making these decisions in good faith in a terrible, terrible situation," Giuliani. Lee Ielpi, a retired firefighter whose son died in the attack, said he understood the emotional reaction some families had on Wednesday, but he said he thought Giuliani was "solid and stayed to the point." "We have to keep a clear mind that the job at hand of the commission is to make suggestions so that the events of 9/11 will not happen again," Ielpi said. "I can't change the past." In the most comprehensive probe of the issues to date, reports by the commission's staff released this week detailed a list of failings including poor communication, gulfs in cooperation between police and firefighters and grave deficiencies in the city's 911 emergency telephone network. The findings led to an aggressive interrogation of Giuliani's top fire, police and emergency management officials by the panel on Tuesday, the first day of the hearings. Giuliani, who has become one of the Bush administration's most vocal supporters, also told the commission that warnings of a possible terrorist attack on New York City contained in an Aug. 6, 2001, White House briefing paper never reached City Hall, but likely would not have changed local security precautions. The intelligence briefing for President Bush referred to evidence of federal buildings in New York possibly being cased by terrorists. It mentioned New York or the World Trade Center three times. "If that information had been given to us, or more warnings had been given in the summer of 2001, I can't honestly tell you we'd do anything differently," Giuliani said. "We were doing at the time everything we could think of … to protect the city." The commission's hearings resume in Washington on June 8-9 and its final report is due July 26. The panel was created by Congress last year to investigate the attacks and advise the country on ways to avoid future attacks.